I have lately moved to the reduced water change way of doing things, gradually reducing water changes over the last couple of months. This is working well, the with Amazon sword showing improved growth, although the rest of the plants suffered until I increased the lighting and finally switched to a “siesta regime”, which is 5 hours on, 4 hours off, 5 hours on, off for the night arrangement. This new regime seems to have helped reduce the hair algae.Since I removed the duckweed (Lemna minor), which was not a great idea, the Limnobium laevigatum (Amazon frogbit) had been flourishing alongside the Riccia fluitans. My friend came twice to check on the fish in the two weeks that I was on holiday and each time did a small water change, then fed the fish. The hair algae has made a come back, while I was away, so I’ve had to pull out more of it. It is growing predominantly on the side of the aquarium where natural sunlight falls. 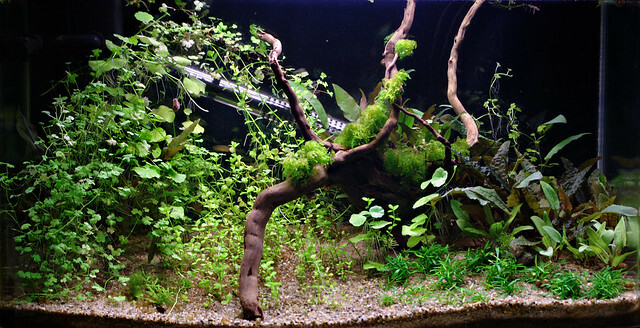 I also gave the plants a trim and did a 15% water change. While I was on holiday, I managed to trade some Crypt. for water sprite and Riccia. Water parameters are nitrate at 30 ppm and pH 7.4-7.6, I also tested for ammonia and nitrite, which I would normally not do in an established aquarium.. both were 0 ppm. Filter claims that it does not need cleaning, so it didn’t get any.